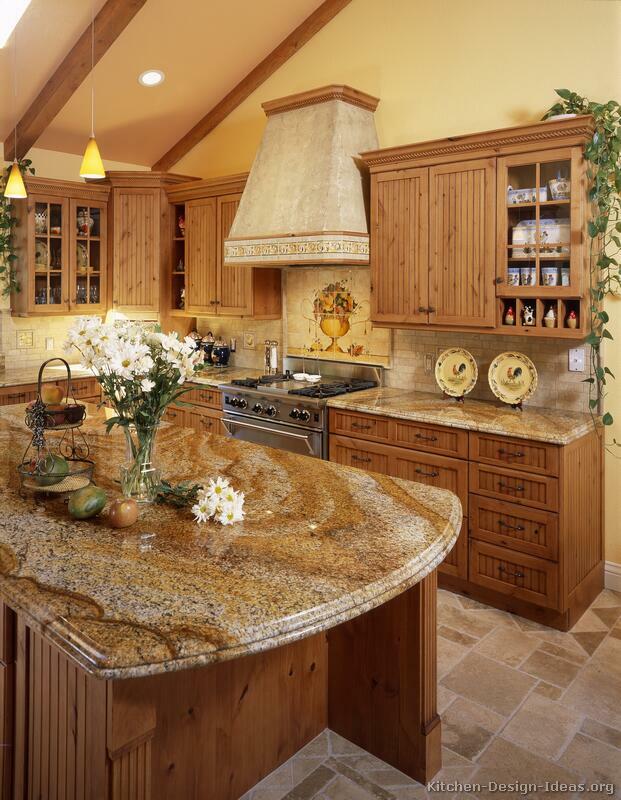 Rustic Luxury: With high vaulted ceilings and a warm color scheme, this luxurious country kitchen maintains a rustic ambiance with its golden-brown knotty alder cabinets and country style decor. Cooking in Style: The beautiful plaster range hood sits just above the hand-painted tile mural backsplash and professional Wolf range. Rooster themed kitchen decore and dinnerware sit on the countertop and in glass display cabinets. A large kitchen island with a built-in microwave and plenty of counter space provides ample room for food preparation with easy access from any part of the kitchen. 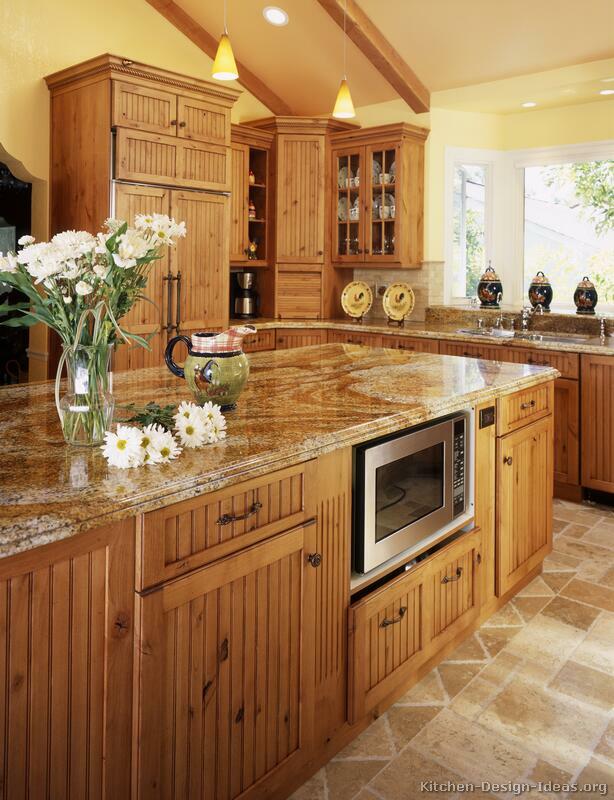 Into the Wood: Beadboard cabinet doors and a wood paneled refrigerator give the kitchen a woody and rustic ambience. A roll-top appliance garage in the corner provides space to hide away a mixer or blender while keeping them easily accessible. 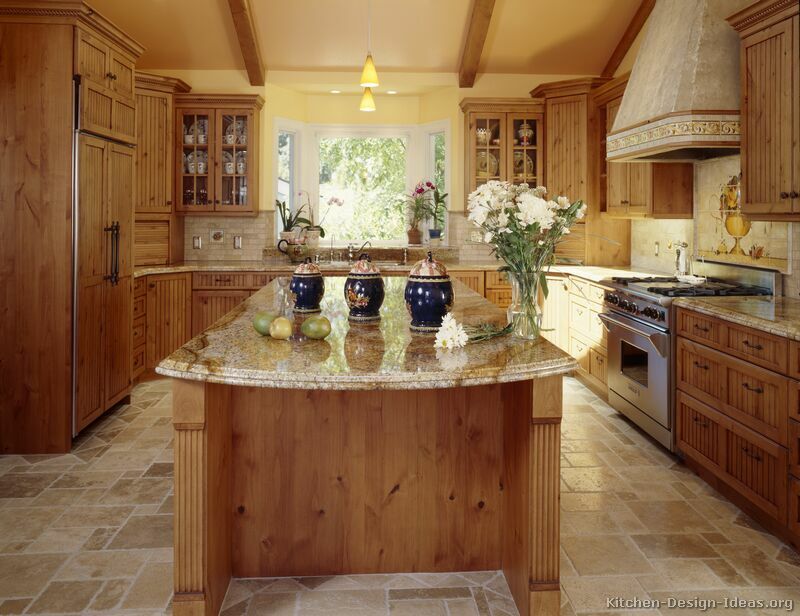 Balanced Design: Set against the golden-brown wood cabinets are light tumbled travertine floors, a travertine subway tile backsplash, beautiful golden granite, and the plaster range hood, each providing complimenting colors and textures to the room. 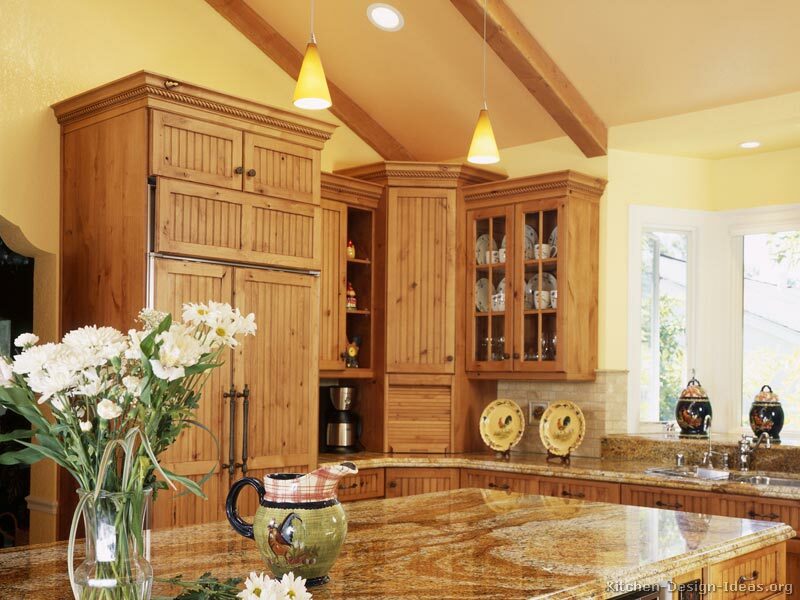 The vaulted ceiling beams and yellow pendant lights are perfectly centered on the bay window and kitchen sink, giving this large kitchen a balanced shape and design. 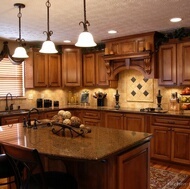 Similar Pictures: This kitchen is photo #2 in the traditional Golden-Brown Wood Kitchens gallery. 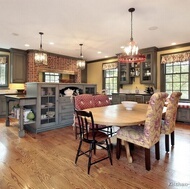 You may also enjoy our article on Country Style Kitchens, with accompanying photos. 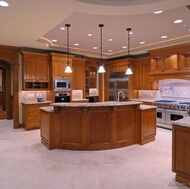 Daily Updates: To see our Kitchens of the Day, visit Kitchen Ideas on Facebook and click "Like" to connect with us. Stay Informed: You should follow Kitchen Ideas on Twitter to get all the latest news and happenings with this site.